I am writing today to remind you of the promise you made in 2012, when you signed into law what was then known as Senate Bill 248 (a.k.a. Public Land Cap Bill). In a July 2, 2012 press release from your office it was stated that Gov. Rick Snyder recently signed legislation to develop a detailed, strategic plan for land acquisition and disposal, establishing a cap on certain public lands until that plan is adopted…Senate Bill 248, sponsored by state Sen. Tom Casperson, caps the amount of land that can be owned by the state at 4.6 million acres until the strategic plan is approved by the Legislature. The press release continued to say that “Public lands are an important part of Michigan’s reinvention, both for recreation and resource-based industries,” Snyder said. “Having a comprehensive management policy for what land the state owns, and why, will help guide the quantity, location and use of our public lands in the future to better serve citizens.” Snyder said he will ask the DNR to work with the Legislature and stakeholders to craft and swiftly adopt the strategic plan. It may be recalled that in accordance with this legislative requirement, the Michigan Department of Natural Resources immediately initiated a public engagement process together with a comprehensive internal examination of Department policies pertaining to the acquisition, sale and exchange of State-managed lands. Out of this process, the Public Land Management Strategy was completed in July of 2013 – well within the two year mandate specified by Senate Bill 248 and your directive. It is worth noting that among its provisions was the commitment to work closely with local units of government to be sure that State of Michigan-managed lands are making a positive contribution to their respective areas and in accordance with the strategic plan. To help illustrate that this strategy was not all about further acquisitions by the State, it also identified approximately 200,000 acres which could be classified as “excess lands” suitable for disposal. As an example of strategic land use, just last year the State of Michigan entered into an agreement which provided for the outright sale of nearly 2,000 acres in Michigan’s eastern upper peninsula, together with the option to purchase and exchange additional State-owned lands for the purpose of creating new economic opportunities for the region. Fast forward to now, late 2016. The completed land strategy has never been formally considered for adoption by the legislature. Instead, we are now on the threshold of the passage of a package of Bills (SB-39/40) which will effectively memorialize the most draconian provisions of the original legislation. These Bills essentially assign a 40% threshold for public land ownership in northern Michigan counties. With all due respect, there is nothing “strategic” about assigning an arbitrary number which has its roots in political compromise. When the original Land Cap bill was signed, most of us believed you when you said that this was a tool to be used in the development of a long term strategy. It now seems that many are ready to ignore this 2012 commitment and turn our public land management decisions over to a handful of local politicians who may not be committed to a public engagement process. A group who, instead, appear to be willing to blindly accept a narrative which suggests that public land is a bad thing which stands in the way of the economic health of our rural communities – this, in spite of all evidence being to the contrary. Senate Bills 39 and 40 need to be amended, or defeated, in an effort to provide for an alternative process which allows for local engagement while not surrendering such decisions to a handful of individuals who were not elected to represent all of the citizens of this state. 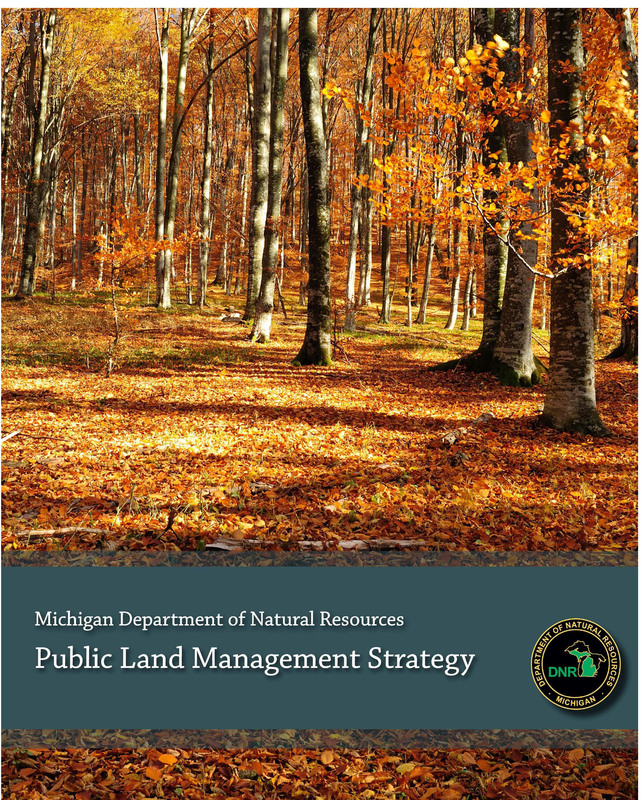 The 2013 Michigan Public Land Management Strategy represents that alternative and is consistent with the promises which were made in 2012.
or electronically by clicking this link (https://somgovweb.state.mi.us/GovRelations/ShareOpinion.aspx) and paste text into Opinion Box and select “Issue” Other/Unknown. Note: This alternative will require a 40% reduction in text.